Home > Fireplaces > Zero Clearance Fireplaces > Empire Breckenridge Deluxe Vent-Free Louvered Gas Firebox with Traditional Brick Ceramic Liner - 36"
Whether you want to update your current masonry fireplace, or want to add an entirely new centerpiece to your home, this firebox provides you with an inexpensive and convenient option. 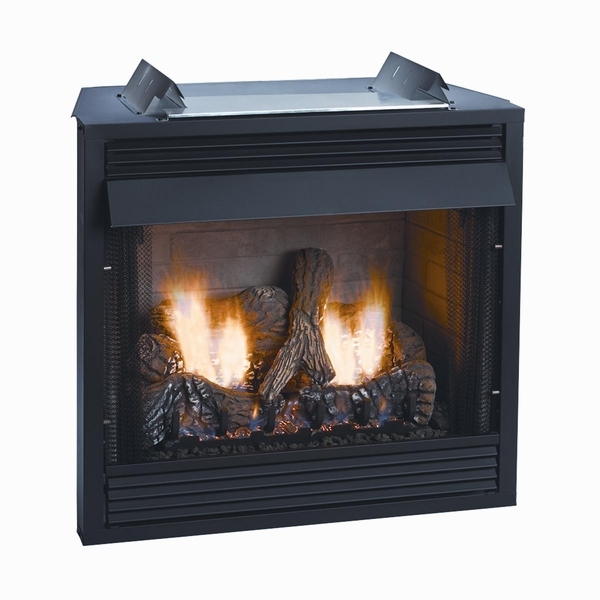 The firebox is simple to install, does not require venting and can be used with most 24" vent-free log sets. The firebox comes with a matte black hood, matte black slat louvers, a traditional brick ceramic fiber liner and a 5 year limited warranty. The specifications are, 37 5/8" H x 39.5" W x 19 13/16" D, framing dimensions, 38 1/8" H x 40" W x 19 3/8" D.
Do these come with blowers? No, but the FBB5 blower is an available option. Can bring my gas line straight up through the floor underneath it? The right side toward the rear of the firebox would be the ideal place to bring a gas line up from the floor below. What type of blower can I use with this item? This unit can use the Empire FBB-5 Automatic Single-Speed Blower - For Breckenridge Fireboxes. What is the shipping weight for this firebox? Does this need a fresh air intake? This firebox weighs 96 lbs. The fresh air intake is optional and is not required, but your application may benefit from it. How many square feet would you say this heats? The amount of square footage heated will depend on the log assembly that is used within the firebox. Most vent-free log sets that fit this box have an output between 36,000 to 40,000 BTUs. This is sufficient to heat an area of 900-1000 square feet, for a home with average insulation and 8-foot ceilings. Is this the firebox only? Yes, this is the firebox only. As the item description states, it can be used with most 24" vent-free log sets. You will need nothing other than the appropriate gas line (natural gas or propane) for operation. Each ventless log set does have the option to add a remote control if you prefer, but this is not required. Easy install; Everything is square and quality! This is a very attractive firebox. The Brick liner makes it look very nice and cozy. Delivery is fast and service is the best ever.